Avoid the harmful chemicals in store-bought toilet cleaners by making your own DIY version. Everyone loves a clean home, but our obsession with sanitation may come at a cost to our health. Some people, especially those with allergies, develop sensitivities to the harsh chemicals in store-bought cleaning products. To escape from the toxic ingredients and irritating scents, a number of homeowners have started turning to homemade cleaning products—right down to their toilet bowl cleaners! Although DIY-ing your toilet bowl cleaner won’t put a surprising amount of money back in your pocket with every batch, it will provide a safe and natural solution for stains. Don’t be intimidated by the extra work it takes to make your own cleaning products: We’ve researched a recipe that’s simple and affordable, so you can whip up your own natural toilet cleaner quickly and without a lot of fuss. In a glass bowl, add two cups baking soda and 100 drops (roughly one teaspoon) of a disinfecting essential oil, such as tea tree oil, lavender, orange, pine, or a blend of oils, any of which are available for purchase in health food stores or online (view selection on Amazon). Make sure your mixing bowl is glass, not any old stainless steel or Tupperware container; essential oil reacts with metal and can even deteriorate plastic. 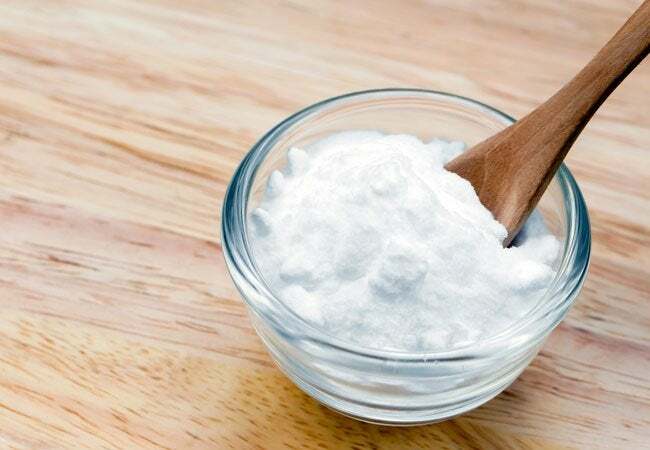 Use a wooden spoon to mix the oil and baking soda together, breaking up clumps as you go. Hold off on the vinegar—as it reacts chemically with baking soda, the two should be mixed only in the toilet bowl during cleaning. You should have enough powder for about 30 uses. To keep the homemade toilet bowl cleaner fresh as you work your way through the supply, transfer it to an airtight glass jar for long-term storage outside of the bathroom—otherwise, excess moisture from steamy showers and long baths may cause clumping and uneven distribution of ingredients. 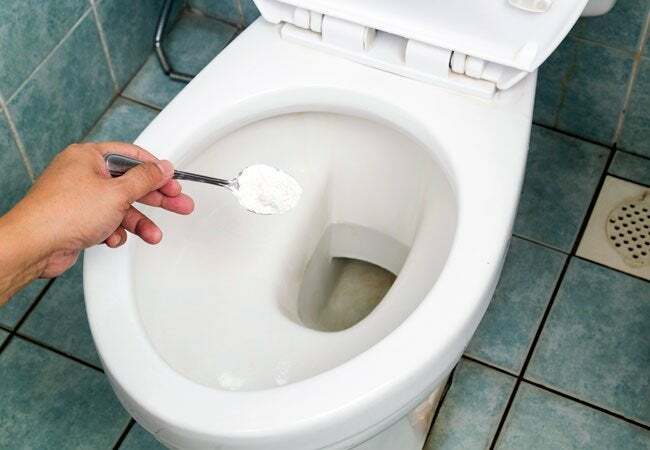 When you’re ready to clean your toilet bowl, drop one tablespoon of the baking soda/essential oil mix into the bottom of the bowl. Sprinkle additional mixture onto the walls of the bowl as well, and use your toilet brush to spread the powder around. The contents of the bowl should start to fizz when the vinegar reacts with the baking soda. If no fizzing occurs, the toilet water may be diluting the mix, or your baking soda may be too old. Try adding another tablespoon of powder and spreading it around. 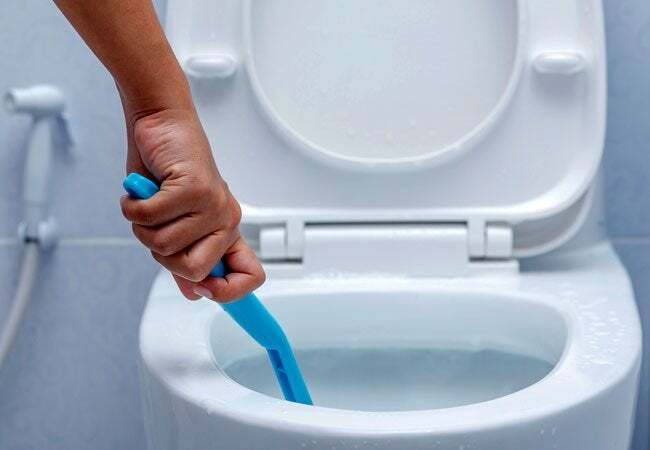 Once the homemade toilet bowl cleaner fizzes, use the brush to scrub away any stains or spots in the bowl. Let the remaining mixture sit for about 15 minutes, then flush the toilet. Easy! Now you can ready to enjoy a spotless bathroom, free of gunk and harsh chemicals!